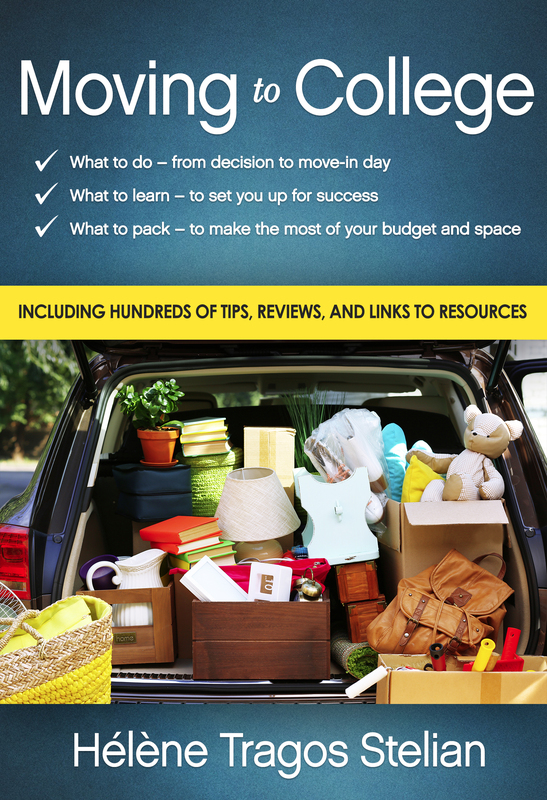 The following is an excerpt from my new book, Moving to College: What to Do, What to Learn, What to Pack. I've carved out just one category, Closet/Room Storage, of the extensive chapter on packing featured in my book to give you a taste of how extensive and inclusive I've made my lists--not to mention all the wonderful links to product comparisons and reviews I include. This also allows you to see how I've bundled items by "essentials" I anticipate everyone will want to bring and then "extras" that mostly won't be needed. So if you focus on the essentials, then scan the extras, your packing list should be reasonable. There are great products on the market aimed at making the most of that tight closet space. Find out what you can about your closet before investing in one or more of these, or wait until you're in the space to purchase any. Here are products that will help you take advantage of any and all spaces in your room, and add more storage than the typical closet, dresser, and desk afford. Again, the more information you have on your room layout, dimensions, and furnishings, the easier it will be to plan for these. If you have little information, it may be best to wait until you're in the room to gauge your needs, then go out to purchase, but be aware many hot items will sell out quickly in nearby stores. Bed risers - these raise your bed to make room for underbed storage, but make sure they're allowed and usable before purchasing them (they don't work on bunk beds, trundle beds, or lofted beds); some colleges even have their beds on risers already. If you're raising the bed a lot, you may wish to consider a footstool to help you up into bed. "Use Bed Risers to Create Storage Space Under Your Bed"
"14 Simple Hacks to Upgrade Your College Dorm Room"
3M Command Adhesive Hooks - many dorm rooms don't allow you to use nails or screws on your walls; these adhesive hooks are removable and will help you take advantage of wall space to hang coats, umbrellas, purses, etc. Bring a variety of shapes and sizes. To ensure a long-lasting hold, wipe the surface with Isopropyl rubbing alcohol first (buy it in convenient wipes). "Command Hooks Are a Dorm Room Savior"
"Command Products: How to Use"